It's approaching Art's Birthday again! January 17th of each year. 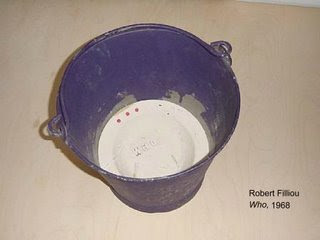 In 1963, French artist, Robert Filliou declared "One million years ago, on January 17, Art was born...when someone dropped a dry sponge into a bucket of water. Modest beginnings, but look at us now. Close the schools and the factories! Let them eat cake and make art! And the next year let it be two days of holiday, then three days, then four, five, six and so on, until everyday is art's birthday, at which point we can all get on with life".The point Filliou was making concerns the making of art as an everyday activity accessible to everyone, not a rarefied object.Since then, a loose network of artists and organizations has celebrated Art's Birthday honouring the Fluxus spirit of art being made not to be bought, sold or traded as a commodity, but given "freely" as a gift. Robert Filliou (b. January 17, 1926, Sauve, France d. 1987, Les Eyzies) a member of Fluxus, the 1960's performance group that specialized in esthetic non-events, believed that art didn't have to express itself in the form of objects. He saw it as a form of play that could even occur as unrealized notions. His minimal-impact works are apt to be made of string, cardboard and wood, the vehicles for stray, vaguely poetic ideas and images. Filliou's ephemeral works undermine heavy notions of what art is or should be. How Mississauga will be celebrating Art's Birthday? The Art Gallery of Mississauga is participating in the Art's Birthday celebration presented by the Office of Arts and Culture, City of Mississauga. This year, Art's Birthday is an ecology-themed celebration. Activities include a Mississauga sound map, sound installation, underground garage sale, art trading-card craft, sound art listening gallery, art-on-air live, radio DJ demos, soundwalks, puppet musicians, underwater (pool) soundtrack, artist performances, open mic, children's workshops, happy birthday choral performance and birthday cake. The Art Gallery of Mississauga will be presenting the work of Mississauga artists Alison S.M. Kobayashi and Gintas Tirilis who have both created dynamic site specific installations for the event. Alison S. M. Kobayashi will be presenting two installations on the birthday theme. Her first installation can be viewed in an Erin Meadows Public Library book case beginning January 6th. The second, in the entrance of the Community Centre, is a playful multi-media installation inspired by the Serge Gainsbourg and Brigitte Bardot music video Comic Strip. Kobayshi combines a retro future aesthetic, celebratory accoutrements and her own performance in a tribute to Art's Birthday. Utilizing an unexpected combination of water and sound, Gintas Tirilis creates a site specific, participatory installation at the Erin Meadows Community Centre. Tirilis's Drip Machine allows visitors to the Centre to trigger and tune unique audio patterns and rhythms by adjusting the flow of water faucets. Each participant's faucet adjustment becomes an original "remix" which includes samples from varying radio stations and pre recorded audio. spoken-word artists, comedians and beat-boxers! Hip-hop Dance Workshop and Theatre Presentation at Art’s Birthday. 5pm - Open Mic with Singer/Song -writer Mike Celia. To participate in the Mississauga Poetry Slam call 647-637-5222. To participate in the Open Mic call the MAC office @ 905-615-4278. Community Centre and Library located at 2800 Erin Centre Boulevard. or mississauga.ca for additional information.